I have been working on reading fifteen books this year that I called theology books, but in truth not all of them are “theology” books. 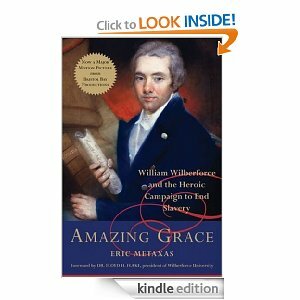 Amazing Grace by Eric Metaxas is a great example of what I mean. It is not a theology book, but a biography of a normal man (William Wilberforce) who did extraordinary things because of the radical transformation that was made in him when He started to have a relationship with Jesus. This book was a nice break from reading about how to change my life to fit more closely to the way God intended. It’s not that I don’t need to hear those things, but reading about a man, his struggles and triumphs inspired me a lot. For those of you who don’t know who William Wilberforce is he was the driving force behind ending the slave trade in England and eventually freeing the slaves in all of the provinces under English control. Wilberforce did many other things to which I cannot address because I would have to literally rewrite Metaxas’ book and he did a great job so I’ll just touch on what was most encouraging to me. With the elections coming soon it is easy to get frustrated by those that are constantly running for office with suspect character, but even though Wilberforce was from a different country and time, he was a politician and that gives me hope that someone here could rise up in the ranks like Wilberforce did and greatly influence our country for God and not for themselves. One of the best statements in the whole book came in the introduction. In Wilberforce’s time slavery was viewed as a good thing that helped all parties. Metaxas said, “Wilberforce murdered that old way of seeing things, and so the idea that slavery was good died along with it. Even though slavery continues to exist here and there, the idea that it is good is dead.” Wilberforce helped people see slavery for what it really was, a horrible and disgusting institution. Could you imagine changing people’s belief about something. I am not talking just a friend or two, but imagine everyone in the world for a long time to come adapting your viewpoint and then doing something about it that led to a ridiculous amount of lives saved. Yeah, that is incredible! I will leave you all with a quote from one of Wilberforce’s speeches in Parliament and hope that this will inspire all of us to stand up for doing what is Biblical no matter what popular opinions dictate. Thank you Mr. Metaxas for writing this book and reminding us about someone who did not live for himself, but for God and all of God’s creation. That is a lesson we can learn and apply to our lives no matter who and where we are. Last year I posted a blog that was a challenge to me and maybe others to read more books about theology this year and to really strive to learn as much as possible about our Lord and Savior from the Bible and other sources as well. 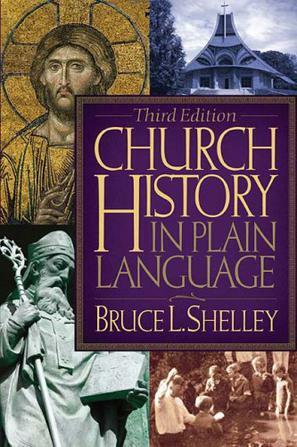 I started out with Church History in Plain Language by Bruce Shelley. I figured this would be a good place to start, giving me an overall idea about how the church is what it is and, to quote Shelley,” to separate the transient from the permanent, fads from basics.” That is my hope for this book among my readers. Shelley, Bruce (2008-12-02). Church History in Plain Language: Third Edition (Kindle Locations 154-155). Thomas Nelson. Kindle Edition. . Little did I know that this book was as long as it is. I started it January 1st and did not anticipate it taking me this long to finish. I didn’t want to rush through it though, so I took my time and tried to commit as much to memory as possible. My original plan was to finish 14 books by the end of the year and while that is still my goal, I have got some catching up to do. I wanted to share a few of the highlights I made that will hopefully give you something to think about. I also will expound upon a few of them to share what thoughts were running through my brain as I read this. This is what I want to talk about today though, in a little more detail than the others. I think we are beginning to see this in the US right now and it seems as though in Europe it has been happening for a while. People are moving away from what their parents and grand-parents did because it became a social habit instead of a lively, energetic all-life encompassing movement in their heart. Church became something to do and that’s all. That is why you have a huge number of people in the US saying they are Christian when in reality it is only because they grew up in the church that they say they are Christian. When need to get back to the revival in our nation like the stats below show is happening almost everywhere but Europe and America. My next book I am reading is Institutes of the Christian Religion by John Calvin. It might be a long one so we will see how long it takes me to finish that one. Let me leave you with this thought by the great evangelist George Whitefield. I can add nothing to this, but an Amen!